The Pipeline Compliance Surveillance Initiative (CSI), a program of the Allegheny-Blue Ridge Alliance (ABRA), is working to crowdsource oversight of Atlantic Coast Pipeline construction. In support of this effort, ABRA has published the CSI Mapping System 4.0, a unique online geographic information system that includes user-selectable environmental layers and provides access to construction plans and aerial photography of construction in progress. Citizens, technical and legal experts, and even regulatory agency personnel, can access the CSI Mapping System to check actual construction for compliance with agency-approved construction plans. 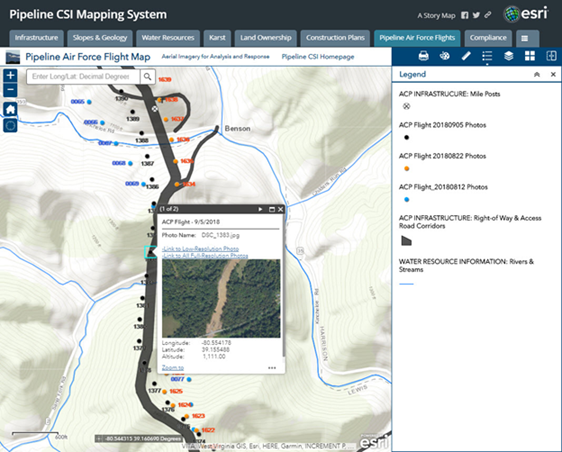 The CSI Mapping System is a cutting-edge tool for public involvement in the regulation of pipeline construction, especially with respect to use of aerial surveillance. The CSI’s Pipeline Air Force, which now deploys on a weekly basis, has obtained thousands of photos documenting ACP activity in the mountains of Virginia and West Virginia. The CSI Mapping System provides access to these photos. As shown in the screen shot below, locations for surveillance photos can be displayed in relation to the pipeline construction corridor, access roads, and other information. When a photo point is selected, a popup window displays a thumbnail of the photo and provides access to both low and full-resolution versions of the photo. In addition, the CSI Mapping System provides access to georeferenced photo mosaics for a subset of surveillance flights. A swipe tool allows direct comparison of construction activity on different days, as well as comparison of construction photos with construction plans. 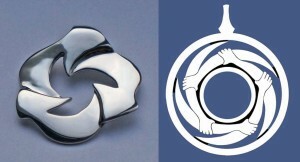 A simplified demo of this capability is provided here. Access to aerial photos is provided on the Pipeline Air Force Flights map page. Photo points provide access to both low and full-resolution photos. The CSI Mapping system also provides a platform for documenting noncompliance with regulatory requirements and legal restrictions. Information concerning site-specific, as well as systemic, noncompliance can be accessed by clicking on points or construction corridor segments. Training in use of the CSI Mapping System can be arranged on request. Additional CSI support for crowdsourcing of ACP construction oversight has been developed through a collaborative undertaking involving local group coordination, on the ground surveillance, water data collection, and legal and technical support. This entry was posted in Citizen Activism, Citizen Surveillance, Construction, Pipeline Route, Take Action on September 15, 2018 by Ellen Bouton.